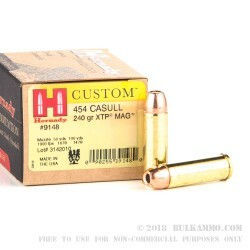 This 454 Casull cartridge by Hornady sports a 240 grain Extreme Terminal Performance (XTP) Mag projectile. 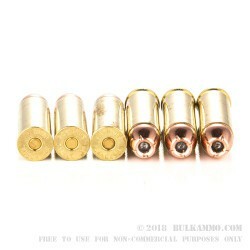 The bullet’s core is swaged to ensure total uniformity of density to balance its in-flight stability and expansion. 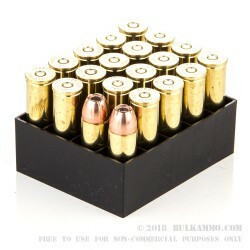 Its drawn gilding metal jacket’s thickness varies down its entire length, which helps to optimally control the expansion provided by the bullet’s hollow core. The jacket totally envelopes the bullet’s exterior to protect its nose, ensuring that the cavity functions properly on impact as well as feeds reliably in semi-automatic weapons. Finally, the jacket’s notches around its tip create fault lines along which the bullet can mushroom predictably. 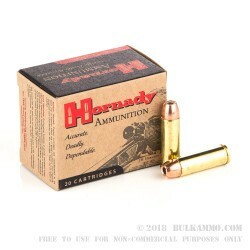 This round further offers a supersonic muzzle velocity of 1,900 fps, select reloadable brass casing, and primer and propellant that are perfectly matched to its caliber. Whether the threats you’re concerned about are the size of humans or bears, this round is poised in every way to deliver for self-defense.